windsound is a poetic and narrative 'text movie' with transliteral morphing. The nodal texts were written by the author, and the work also includes the author’s translation of a Song period classical Chinese lyric, ‘Cadence: Like a Dream’ by Qin Guan (1049-1100). McHugh's remarks encouraged me to think more about the apparatus of literal processing in a subsequent essay, inner workings. In January 2006 I made a 'QuickTime rendition' of windsound. This made it 'cross-platform' for the first time (so long as you have QuickTime installed in some form). A browser-viewable mp4 version of this movie is provided here (as of Spring 2018). In this rendition windsound is presented as a twenty-three minute digital video. In the original version of windsound (for Hypercard) the transliteral morphs—and resulting transitional states of the text—were software-generated, and the speech synthesis was 'live.' This video rendition is, however, a more or less conventional movie: the record of one of many potential performances. The HyperCard version of this work is still for Macintosh only. 'windsound' requires (as minimum): - an Apple PowerMac computer with about 32 Mb RAM; - system 8.6 or better; - Macintalk Pro (speech synthesizer) installed, including the voices: 'Bruce, high quality', 'Victoria, high quality' and 'whisper'; - the fonts Monaco and Courier installed; - a display of at least 800 x 600 pixels. Under Mac OS X 'windsound' runs under in the Classic environment. If you have a suitable Mac, all you need is the download. The download is approximately 1 Mb and it will start immediately if you click the link below. To start: double-click windsound (stack/application icon). To close: either let the performance finish and click 'END' or to exit quickly Command-[full stop] and Quit. - To read windsound in 'full screen' mode (recommended), set your monitor to 800x600 pixels. - Once 'windsound' is open simply click the 'Begin' button. - pressing and holding down the option key skips (after a short time) to the 'credits' section of the sequence (which is integral to the piece). - When reading 'windsound' you should: 1) see animated text, 2) hear a continuous low-level audio track, and, at various appropriate times, 3) hear synthesized speech from one or other of the three voices. The nodal texts of 'windsound' were written expressly for the piece. My own translation of a Song period lyric, 'Cadence: Like a Dream' by Qin Guan (1049-1100) is also used. 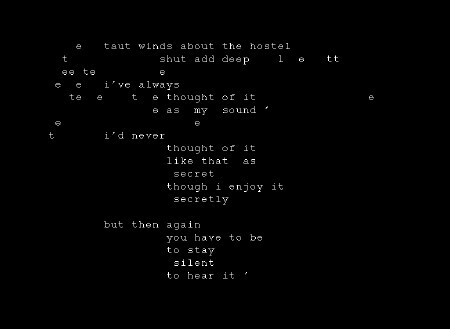 Although 'windsound' plays as an all-but-linear movie, the transitional texts are algorithmically generated. Later pieces, further developing these principles, are both navigable and have transitional phases which are generated 'on the fly'.